Whether you are one half of a couple on a romantic getaway or part of a big family seeking to enjoy quality time together, whether you would rather indulge in sensual spa therapies or spend an afternoon exploring the vibrant reefs, there is literally something for everyone. 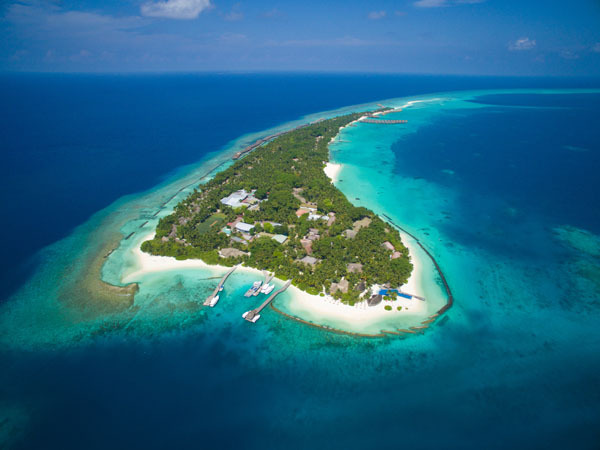 One of the first Maldives island resorts to welcome guests, Kuramathi is an island of choice, offering a range of villas, numerous dining experiences, diverse facilities and, of course, welcoming and friendly service that the Maldives is known for. Located 56 kilometres west from Male' International Airport, the island is over 1.8km long. Guest villas are scattered around lush gardens, facing secluded areas of long beaches or poised over water. Many areas of the island remain untouched, inviting guests to leisurely stroll along deserted beaches or through virgin vegetation. Guest villas are scattered around lush gardens, facing secluded areas of long beaches or poised over water. In addition to the three main restaurants where international buffets are served for breakfast, lunch and dinner, Kuramathi offers nine à la carte restaurants offering a range of cuisine to suit all palates. Seven bars around the island serve classical and tropical cocktails. Depending on your mood, listen to mellow sounds of our two-piece band or while away the day sipping flavorful concoctions. Be spoiled for choice. As one of the Maldives spa resorts, Kuramathi offers you an experience that is both remarkable and unforgettable, blending inner beauty with our surroundings and landscapes. Each treatment offered at Kuramathi Spa for face and body, is performed according to medical analysis, carried out with an individually elaborated scheme. The well-being of every guest is the ultimate goal.